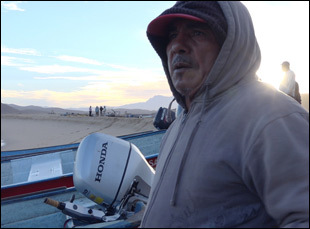 On chronicling a two-and-a-half year struggle of a Mexican fishing community fighting to hold onto beachside property coveted by American developers. It all sounds so rosy in the opening of “Patrimonio” when co-directors Lisa F. Jackson and Sarah Teale find their way into a promotional sales event for Tres Santos, a planned beach community in Baja California with ambitions of becoming a tourist destination cash cow like nearby Cabo San Lucas. “We’re creating an epicenter of wellness,” proclaims a representative for Black Creek, the Colorado-based land developer, with the aim of luring Americans south of the border, though as Jackson and Teale reveal only moments later, there is already more than enough people living in Todos Santos where Black Creek plans to set up shop, a vibrant village made up of fishermen who make their living off their proximity to the sea. 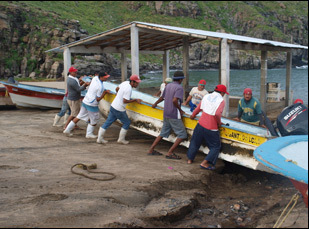 While a showdown brews between the fishermen and Black Creek and their Mexico-based partner Mira when the latter secures the Federal Beach Concession permits through sketchy means to Puntos Lobos Beach, which have been long held by the fishermen, with plans to break ground on Tres Santos, it is Jackson and Teale who are able to dig deep into the dispute as the two sides are only able to dig in their heels over two-and-a-half years over who controls the land. Although Black Creek and Mira appear armed with a vast array of resources and deep government ties, the fishermen find strength in organization and an advocate in John Moreno, a cunning lawyer who grew up in the area with an increasingly compelling case against Tres Santos, which would deplete Todos Santos’ water supply from the town’s closed-circuit aquifer. As the fishermen and ranchers from the region join forces to protest Tres Santos, Jackson and Teale observe how a lack of cultural sensitivity and an overabundance of entitlement on the part of Black Creek and Mira poison the waters even before construction can begin, inspiring marches and blockades that leads to a fight that eventually reaches the courts and for as much as the locals endure during these trying times, the filmmakers stick it out to capture every last twist and turn. 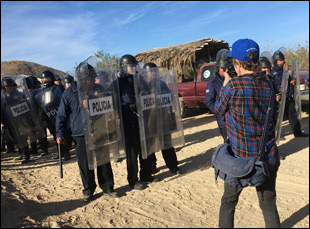 Shortly before the film’s New York City premiere at DOC NYC this week, Jackson and Teale spoke about bringing transparency to such an opaque redevelopment project as Tres Santos, earning the trust of their subjects and how the film plays in Mexico. Sarah Teale: My husband had a house there [in Todos Santos] for a long time and Lisa and I just finished a film [“Grazers: A Cooperative Story”] together and I invited her down to do some filming in the Sea of Cortes. Instead, we heard of this mega-development and that the fishermen were all fine with it, but then we decided to go and ask them. That started a saga that changed Lisa’s life anyway. Lisa F. Jackson: We knew we had some incredible characters and it was a classic David versus Goliath epic with the fishermen against these billion-dollar developers. We didn’t know we had a feature, but you get on the train at the beginning and you do not know what the destination is, but we started shooting. Sarah Teale: We thought we were just going to make little films to educate the community about what was going on and it just kept growing. At the start of the film, you have footage from a Black Creek recruitment event in New York. How did you get into that? Lisa F. Jackson: Yeah, that was one of the first shoots and we had put ourselves on the interested list, so we got invited and I asked for permission to film and they said, “Absolutely!” That was one of the early, early shoots. Since it’s such a secretive operation, was it difficult to find out more information otherwise? Lisa F. Jackson: It was. As you could see from the film, we asked for interviews with everybody from Black Creek and from Mira and everybody turned us down. So what we know about them, we got from their public filings, from websites and general research because they weren’t telling us anything. And the fishermen have cell phones, but they’re not online, so all of that information we got and then John [Moreno] joined the fight three or four months in and he became an incredible source of information, just through his channels in Mexico City. Sarah Teale: And we kept expecting them to do the right thing to [as far as the development] or at least we were hoping that they would do the right thing, so it wouldn’t have to get quite so violent. Lisa F. Jackson: Every single chance they had to do the right thing, they did the wrong thing, like not showing up at a public meeting or starting construction right after saying they were not going to build for two weeks. It pissed the fishermen off so much and we would both go, “Too bad,” and then “Yippee!” because if they had done the right thing, we wouldn’t have the film that we had. [laughs] And when Mexicans see the film, it infuriates them because it lays bare the corruption and the collusion between the business and their governor. Obviously, they’re right to be distrustful of any foreigners – was it a challenge for you to get their trust? Lisa F. Jackson: It was gradual. I speak Spanish, but I don’t speak fisherman’s Spanish, which is very…colorful, I’ll say that. We just kept showing up and I began to lace my conversations with all of the curse words they were using and hanging out with the families and showing up at dawn when the boats launched and being there when they came back. I was always there at every meeting and every march and they were very accepting. We also gave everybody an opportunity to opt out and made clear from the beginning that we were going to be there until the end, whatever the end was. We were proud to be included and very proud of their struggle and wanted to document it, so they said, “Come on!” They, of course, didn’t know what they were getting into, but they were happy to have someone pay witness. I want to tread lightly so as not to spoil the film, but one of your main characters Rosario Salvatierra, a fisherman, essentially disappears midway through. What happened? Lisa F. Jackson: His wife was dying. Yeah, and he was at her bedside at the hospital. His daughter also drops out after the lawsuits hit because he was very concerned for her safety and out of an abundance of concern, he asked her to withdraw a little from the public arena. There was a lot of life that went on on the side that affected things and there were just all these story beats that we decided not to follow because it was overstuffed as it was. What’s it been like traveling with it? Lisa F. Jackson: And the ones in Mexico are very emotional with people embracing the characters John or [Quirino] Cota, the rancher. We took the fisherman’s daughter to Mexico City with us a couple weeks ago and she stepped forward very eloquently and said, “We’re not against development, but it should be sustainable and respectful and should involve the people.” It’s such a simple message, but people cheered her because they were all speaking truth to power, which is something you do at your own risk in Mexico. It can get you in trouble or it can be completely ineffectual, but here it actually had a good outcome, which is really unusual. There’s lots of stories of people going up against corporate giants and not doing so well, so people are really inspired by this and it’s been really cool. “Patrimonio” will play at DOC NYC at the IFC Center on November 13th at 5:15 pm and November 14th at 10:15 a.m. with the filmmakers in attendance. Interview: Narcissister on Unmasking A Fascinating Family History in "Narcissister Organ Player"
AFI Fest '18 Interview: Dominga Sotomayor on Making Memories with Cinema in "Too Late to Die Young"